After working with this Creative Inquiry process for a while, it is good from time to time to review your pages with the inquiry of what is the gift or gifts you have received from this experience. This often involves taking a couple of hours to really see and hear the deeper meaning that has been revealed in your images and words. For me this generally involves more writing, often with bullet points that really define the key points that I can tangibly see have influenced my growth and healing. It also includes lessons and insights that I need to remind myself of, lest I forget them in the business of life. For even in the most challenging of times, we can find ways to access our own wisdom, strength and courage. This process is designed to be a source of inquiry into the very nature of your true Self and a larger perspective on reality. This process is designed to help the collective by helping us find the truth inside of us and enabling us to share that with the world. Yet we have to consciously choose to review and extract the meaning for ourselves. Otherwise we can tread water in our own emotional eddies and keep recirculating the same issues again and again without gaining the insight that lies right under our noses. So this is what I urge you to take time to do now, yes, right in the middle of the chaos, complexity and demands of daily life. Find a way to use this experience to create lasting change in your relationship to yourself, to other people and the world itself. In this image you can see that I have used both sides of the page for the image, which began by randomly running a charcoal pencil across the paper. Soon I saw petal shapes and then filled them in with color. 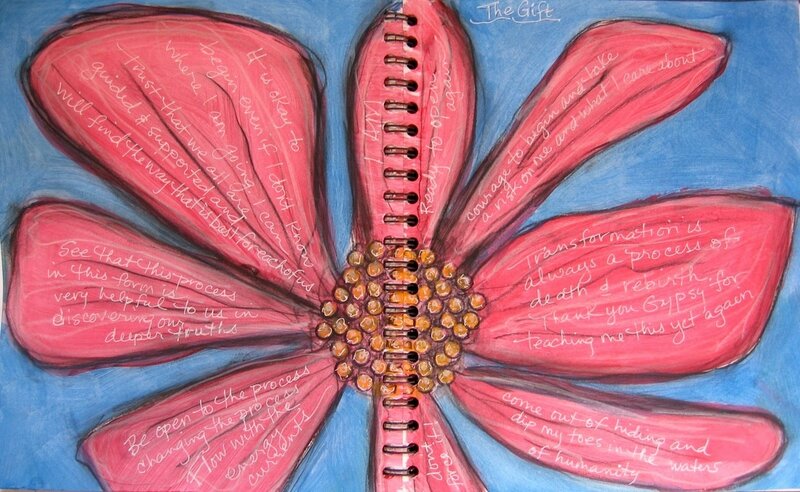 Finally I chose to write my insights right on the petals themselves, representing integration for me. Come out of hiding and dip my toes in the waters of humanity. Be open to the process changing the process. Flow with the energy currents. I AM ready to open again. See that this process in this form is very helpful to us in discovering our deeper truths. It is okay to begin even if I don't know where I am going. I can trust that we all are guided and supported and will find the way that is best for each of us. Transformation is always a process of death and rebirth. Thank you Gypsy for teaching me this yet again! ​Courage to begin and take a risk on me and what I care about.